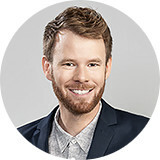 Andreas Schedler is Senior Media Consultant at Iventa:M4J Personalwerbung GmbH. This adventurous globetrotter from Vorarlberg gained comprehensive work experience in diverse service jobs after graduating with a degree in sociology, and marketing and sales. He uses his practical know-how for target group specific ad placements for his customers.